♣ Running along the miles of scenic trails around Lady Bird Lake–actually a dammed section of the Colorado River–despite getting caught in a fierce thunderstorm complete with flash floods and marble-sized hail. 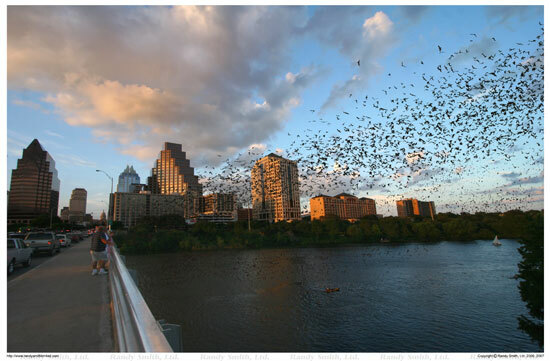 ♣ Gathering on the Congress Street “Bat Bridge” to watch a million thumb-sized Mexican free-tail bats pour out from underneath on their nightly hunt for insects. More cool than creepy. ♣ Posing for a picture under Ann Richards’ portrait in the beautiful pink granite state capitol—which stands a foot taller than Washington’s, our cab driver told us, lest anyone doubt that Texas does everything bigger. ♣ Listening to a snappy local band called Ghosts Along the Brazos at The Continental Club on vibrant South Congress street. We weren’t the oldest patrons there, though we might have left the earliest. 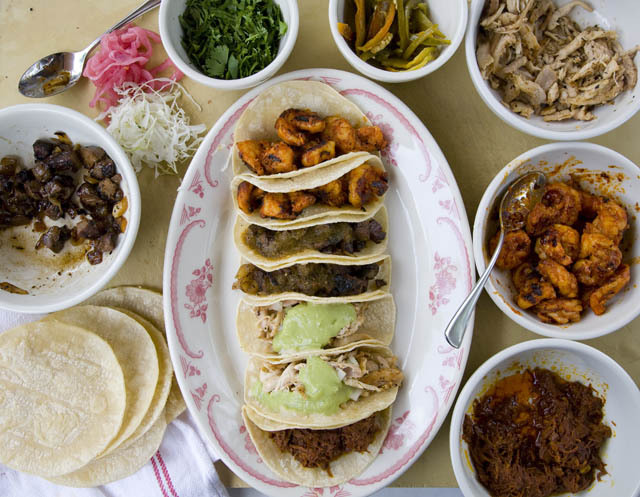 ♣ Dining on spectacular noveau Mexican cuisine at La Condesa–tostadas with crab, mango and grapefruit; decadent ears of roasted Mexican street corn, coated with cotija cheese and ancho chili powder and served on a skewer–which not even a sudden fainting spell by our friend Archie could diminish. ♣ Reading letters, journals, and rough drafts of such writers as Norman Mailer, Don Delillo, Woodward & Bernstein, and David Foster Wallace in a special exhibition at the Harry Ransom Center (which also houses an original copy of the Gutenberg Bible)–one of two outstanding museums, along with the Blanton Museum of Art, on the University of Texas campus. ♣ Watching the uproarious new Kristen Wiig vehicle “Bridesmaids” at the Alamo Drafthouse at the Ritz, a great old downtown cinema that serves cocktails. ♣ Marveling, repeatedly, at the enviable quality of life Austonians enjoy, from the rampant outdoor dining opportunities to the low-key dog parks—bastions of friendly mutts off-leash—to the vast spring-fed public pool in Zilker park. ♣ Cold, dreary, New England spring weather, forecast for the entire week. ♣ Rotting leftovers in the fridge and a pile of cleats under the kitchen table. ♣ Two extremely happy and relieved dogs. ♣ A very proud 16-year-old, who had been called up from her high school’s JV softball team to play in two Varsity games–a debut I, naturally, missed. ♣ An eight-year-old sporting a new necklace and bracelet that she had persuaded the babysitter to shell out $21 of my money for. ♣ Three unfamiliar, nondescript chairs that my husband had rescued from a curbside trash pile–they were there for a reason!–which are now cluttering up various rooms. 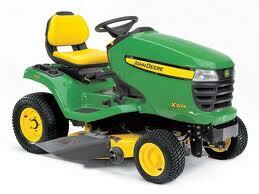 ♣ A shiny new John Deere riding mower, complete with “mulching blade”–the latest acquisition in my husband’s bid, as he put it, “to take back control” of our house and yard. ♣ Wet, freshly-cut grass all over the kitchen floor. ♣ An ecstatic, suddenly helpful 13-year-old son, who spent hours thinking up new reasons to ride the mower, such as to haul mulch across the yard or retrieve the mail. If he could fit it up the stairs, I do believe he’d even use it to clean his room. This entry was posted in Family life, Kids, Parenting, Travel and tagged Austin, girls' weekend, leaving the kids. Bookmark the permalink. Those chairs? Sam found them first. I made him put them back. Bill must have done a late afternoon sweep. NO!! Really? Two green and a black?? That is too funny… you have more fortitude than I. Also, I’ll trade you the grass cuttings for the dirt clods my kid’s shedding all over our house from her cleats.